After capturing the hearts of international moviegoers and film critics in its world premiere in the prestigious 66th Cannes International Film Festival in France and bagging honors in the recently held 2013 Puchon International Fantastic (PiFan) Film Festival in South Korea, the much talked about action-thriller co-produced by Star Cinema and Reality Entertainment, "OTJ" (On The Job), will finally hit Philippine cinemas on August 28 (Wednesday). 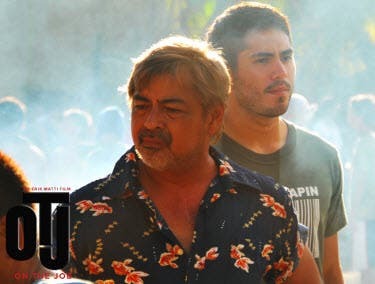 Under the direction of award-winning filmmaker Erik Matti, “OTJ” is topbiled by two of the most brilliant actors of their generation Piolo Pascual and Gerald Anderson, veteran actor Joey Marquez, and 2013 PiFan Film Festival best actor Joel Torre, who are all hands-down to their film’s one-of-a-kind script. 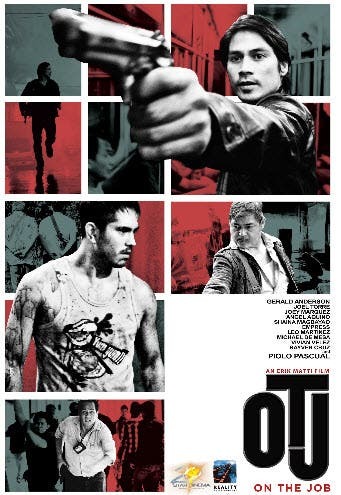 Part of the continuing grand celebration of Star Cinema’s 20th anniversary, “OTJ” shares the personal quest for justice of three men–NBI agent Francis (Piolo), Sgt. Joaquin (Joel), and two prisoners Daniel (Gerald) and Tatang (Joel). If “OTJ” is memorable for Piolo and Gerald because it is their first action movie, it also made a mark in the heart of Joel because of the important character given to him by Star Cinema at Reality Entertainment. Joey, meanwhile, is excited about how viewers will respond to the ‘new Tsong’ that is featured in the film “First time sa ganitong klaseng film na medyo unorthodox kumpara sa usual na ginagawa ko. Sa ‘OTJ,’ aksyon na aksyon talaga ako! It was a very challenging role. Parang it’s something that somehow ‘upgraded’ me my little experience sa showbusiness,” said Joey. Also part of “OTJ” are Angel Aquino, Shaina Magdayao, Empress, Dawn Jimenez, Leo Martinez, Michael de Mesa, Vivian Velez and Rayver Cruz. Don’t miss the internationally-acclaimed action-thriller na “OTJ,” showing on cinemas nationwide on August 28, 2013. For more information and latest updates about “OTJ” and other Star Cinema’s 20th anniversary movie offerings, simply visit www.StarCinema.com.ph, http://facebook.com/StarCinema and http://twitter.com/StarCinema. MAG INGAT PO KAYO… LAHAT NG MAKATAMBAL NI PIOLO MAWAWALAN NG CAREER… SALUT ANG PAMINTANG BAKLANG YAN. BAKIT DI KA NA LANG MAMAHINGA ATE PEPE… KAYO NI JUDAY MGA LAOS NA KAU… TANGGAPIN NYU NA YAN, WALA NG GUSTONG MANOOD SA INYU. GAGASTOS MAN KAYU NG MILLION PA PRESS PARA UMANGAT ANG PANGALAN NG HINAYUPAK NA YAN – WALA PA RING MABAGO, BURARAT PARIN HANAP NYAN! for sure i will watch the movie. piolo and gerard are both good actors and super pogi. naku naman…walangwala to sa mayledibos. ang galing kaya ni mar-yan sa sine na yon….kaya nga kinabog sa baks opis ang itiks-aman-an-awoman ni sara. mar-yan, the praymtaym kwen, bes aktres op ol taym, the seksyest, komedi kwen, the pretyest op dem ol. naku naman…walangwala to sa mayledibos. ang galing kaya ni maryan at retsard….kaya nga kinabog sa baks opis ang itiks-aman-an-awoman ni sara. maryan, the praymtaym kwen, bes aktres op ol taym, the seksiest, komedi kwen, the pretiest op dem ol.